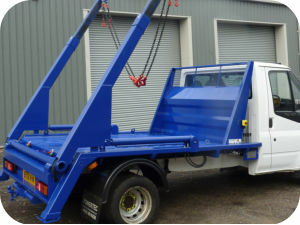 The development of our new and exciting product was driven by so many of our customers asking if we could produce a skip loader with telescopic arms that could deliver 3 x 8 Cubic Yard Skips and be mounted onto a 3.5T Gross Vehicle Weight (GVW) Chassis. Using the latest in design and stress analysing equipment, Powertec have developed a light weight skip loading unit using high grade steels to maximise weight saving and maintain strength. This equipment comes as standard with independent extending arms and independent rear stabiliser legs. 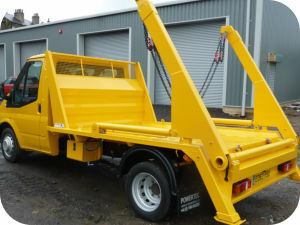 There are many benefits to having the Powerlift 3500EX skip loading equipment fitted to a 3.5T GVW chassis. The main ones being the fuel saving made when delivering large skips compared with the cost of running an 18T GVW Chassis. This equipment can be driven on a car licence and without an operator's licence. 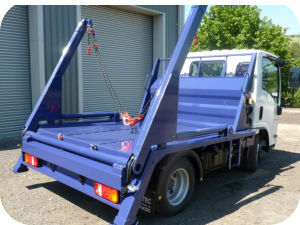 Totally manufactured in the UK this Skip Unit can be fitted to any chassis of your choice.